Hockey Plumber: Mike Fisher To Nashville. Is It Personal? 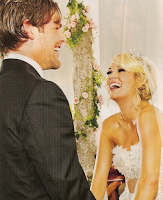 Mike Fisher To Nashville. Is It Personal? Mike Fisher plans on being a Nashville resident some day, but he has no interest in giving up his Ottawa address any time soon. “I definitely love it here. I don’t see that happening,” the Senators centre said in an exclusive interview with the Sun — when asked about any desire of finishing his career as a Predator — a little more than two weeks after being wed to country singing superstar Carrie Underwood. “When I’m done hockey, she’ll still be working. I’m sure she can always work. We’ll settle in Nashville. I love it there. I’ve got lots of friends there now, I love the area. I like a lot of things about it. There’s a nice church that we love, that we go to ... that being said, it’s a little ways away. I want to obviously play a few years, a bunch of years here yet. Just imagine the look on Gomer's face when "Surprise, surprise" the Fishers are here for choir practice! "Golly gee!" - Alright Nashville, ease up. We know Gomer is from Mayberry. 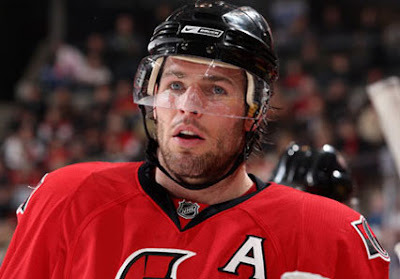 As Puck Daddy mentioned... "There had been some debate about whether Mike Fisher did or did not have a no-movement clause in his contract, but the Ottawa Sun reported last week that he had no control over his next destination if he was traded this season." Since he wasn't going to finish his playing career in Ottawa, we get the feeling that the Sens shopped around and figured that Fisher would be least disappointed going to a place that was convenient for the wife. "He plays playoff-style hockey all season long. He plays on the power play, kills penalties, is strong on draws and can match up against any opposing line." The Sens gain Nashville's first-round selection in the 2011 Draft, and a conditional 2012 selection that can range from the second to third-round. However, Nashville gets Carrie Underwood's husband! From a regional PR perspective, it seems a little unfair. For Senators fans this has to smack of a certain je ne sais quoi! Does it seem a little too storybook ending? The Senators, were forced into rebuild mode when Sergei Gonchar failed to transform into a reincarnated Bobby Orr. Trade talk has swirled around the franchise regarding team captain, Jason Spezza, free-agents to be Jarkko Ruutu, Chris Phillips and Alexei Kovalev for months. Yet, moving one of them would be a welcome sight, as aside from Ruutu, the aforementioned players have underperformed lately. Trading one of the few guys (Fisher) who gives an honest effort every night has to sting, regardless of whether it was an expected move or not. The only salve that can heal a wound like this would be for those draft picks to turn into something far better than a Mike Fisher, but hopes can't be all that high right now. Sounds a bit like the makings of a country song, no?